Tihany wreck, real name Etnea, was wooden cargo ship sunked on 8.11.1894 near Unije. 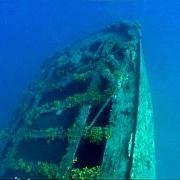 Interesitng for all diving categories becouse wreck is laying on the wall, start from 3m. Wreck starts on 28m. With good visibility you can see wreck from 12-15m already.